Welcome to Domain Stadium for the Fremantle v GWS Giants Round 7 clash. GREATER Western Sydney has strengthened its finals credentials with a hard-earned 18-point win over Fremantle at Domain Stadium. 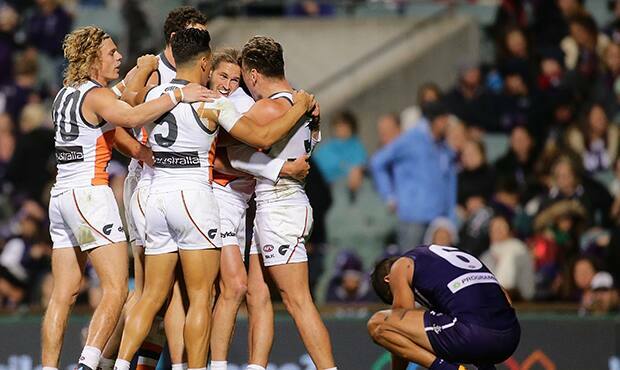 The Giants broke their duck in Perth after going winless in their previous six attempts, winning 14.11 (95) to 11.11 (77) to consign the Dockers to their seventh-straight loss to start the season. The Giants set up their win with a blistering 15-minute burst in the second term when they kicked 5.2 to no score to open up a 20-point half-time lead. 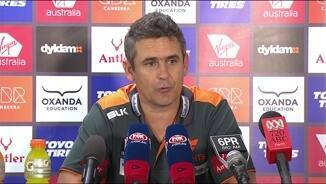 Giants Leon Cameron said he was proud of his group's performance given Fremantle surged back in the second half. "If they had kicked straight the scores probably could have been a bit closer at three-quarter time," Cameron said post-match. "They missed a few opportunities that they would normally hit. 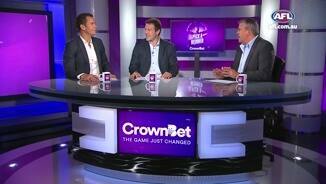 "Playing Fremantle is a tough game of footy. We knew exactly what it was going to be like. They gave everything and we responded and I was proud." Stephen Coniglio was outstanding in the midfield with 32 disposals and two first-quarter goals. Callan Ward had 31 touches in his 150th game, including 19 contested, and seven tackles. Josh Kelly gathered 26 disposals, three score assists and a goal. Shane Mumford was outstanding in the ruck with 42 hit-outs. Lachie Neale fought hard for the Dockers with 25 contested possessions in his 33 disposals, but his kicking efficiency let him down. Stephen Hill (27 disposals) and Danyle Pearce (26) were damaging at times and Michael Walters was lively but inaccurate in front of goal. 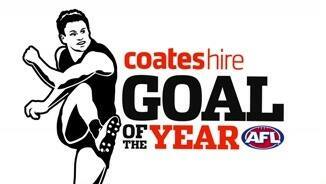 Chris Mayne kicked three goals for the first time in his last 15 games. 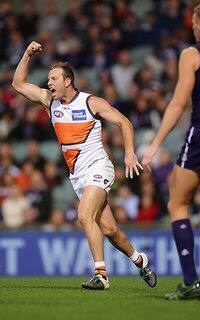 The Giants sliced open the Dockers at stoppages in the first half. They kicked eight of their 10 first-half goals from stoppages, including four from boundary throw-ins inside forward 50. Mumford had a huge influence with 10 hit-outs to advantage in the first half alone. The Giants finished with 11 of their 14 goals from stoppages. 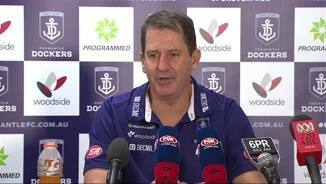 Dockers coach Ross Lyon said he saw signs of progress but said the stoppage goals were the difference in the game. "There was some progress," Lyon said. "But really simply I thought our intent and our attack on the ball and our surge and when we went forward we were scoring a bit but by the same token they kicked a lot of easy stoppage goals in the first half. It was eight goals to two, which is huge. That's really what the story was." The Dockers lifted their intensity in the third term but their finishing let them down. They had 22 inside-50 entries in the third term but only managed 2.6 and two out-of-bounds-on-the-full. The Giants kicked 3.2 from just seven entries to extend their lead to 22 points at the last change. 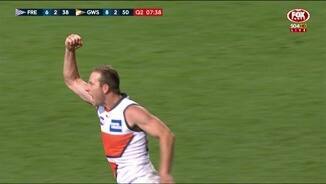 The visitors did not kick a goal between the 14-minute mark of the third term and final seconds of the match when Tom Scully snapped truly. But they withstood the Dockers' charge to stay in touch with the top four. Fremantle: Ethan Hughes tweaked his ankle in the second term but played out the game without issue. Greater Western Sydney: A hamstring injury to key defender Phil Davis soured the win. "(He) just gave it a little tweak," Cameron said. "Whether that is a week or two, we'll find out in the next 48 hours." 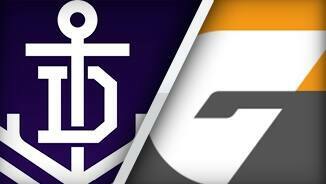 The Dockers face the might of Hawthorn at Aurora Stadium in Launceston next Saturday afternoon. The Giants travel home to meet Gold Coast at Spotless Stadium.